I’m so excited to introduce these uniquely gorgeous blooms… Best of all, they’re extremely easy to do! Among the tulips are these beautiful Lily Flowering Tulips that are distinguished by their unusual pointed petals. One interesting fact about these Lily Flowering Tulips is that they naturally open out in the sun and closes in cool temperature. 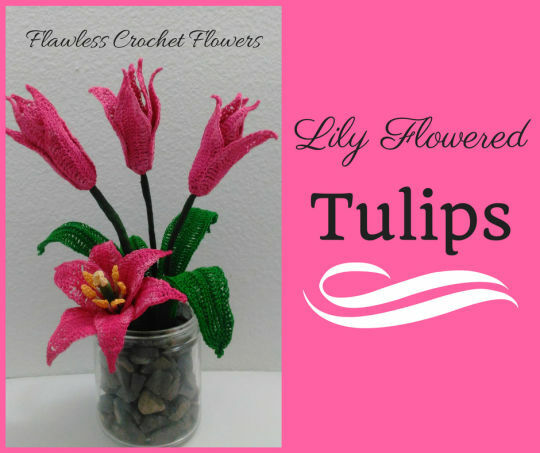 With that fact, this pattern makes it fun as it allows you to create the blooms both open and closed. Are you still sending emails? I haven’t got one in a long time! I am Charlotte… I’ve been so busy getting ready for our upcoming CAL I haven’t had the time.